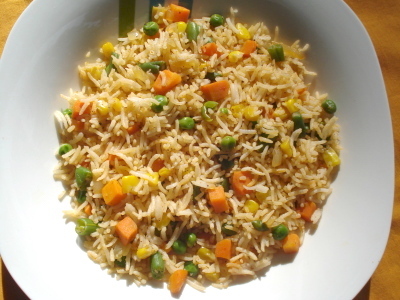 How to make quick veg fried rice at home. Easy and delicious Indo Chinese recipe. Cook rice with Salt and 1 tsp of oil. keep aside. Each cooked rice should be well separated and fluffy. If you use basmati Rice, then use 1.5 cups of water for each cup of rice. For Sona masoori rice, use 2 cups of water for each cup of rice.Let this cool completely once it is cooked. Heat Oil in a pan. Add Onion and fry till they are transparent. Add cut Vegetables and fry till they are crispy and cooked. Add Soy sauce, Chili sauce, Salt and Pepper, Saute it for 1 or 2 minutes. Finally add cooked Rice and stir it for a minute.